Fragrance Emerald is located along the vibrant Geylang District, a 15-minute drive from the popular Orchard Road. Surrounded by many famous local eateries, this cosy hotel offers free parking onsite. Fragrance Hotel-Emerald is a 20-minute drive from Changi International Airport. It is a short stroll from Aljunied MRT Station and a 10-minute drive from the Central Business District. 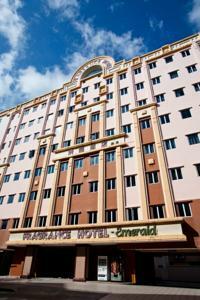 Rooms at Emerald feature modern furnishings and are fully air-conditioned. Each room has a tea/coffee maker and TV. The attached bathroom offers hot shower facilities. Fragrance Hotel-Emerald provides laundry services. Luggage storage is available at the 24-hour front desk. In addition, the hotel can provide guided tours upon request. Rooms: Hotel Rooms: 126, Hotel Chain: Fragrance Hotel. American Express, Visa, Euro/Mastercard, JCB The hotel reserves the right to pre-authorise credit cards prior to arrival.